The $200 million project will last two years. 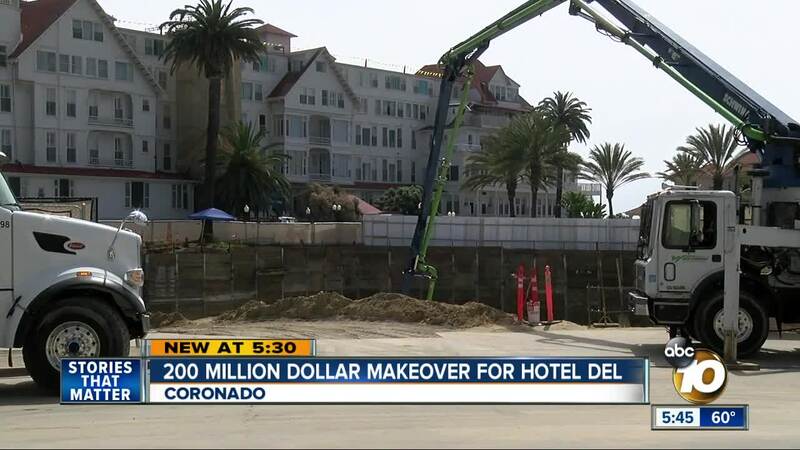 CORONADO (KGTV) - The 200 million dollar project is being called the "Reimagination" of the Hotel del Coronado. The plans have been in the works for almost 20 years according to Coronado resident Felicia Bell, "17 years ago in 2002 when it was first presented to our community and the California Coastal Commission". Bell tells 10News the Hotel del holds a special place in everyone's heart, "my two daughters were married there". The beachfront resort just celebrated its 130th anniversary. The history makes it much more than a resort to the community, "this represents our history here in Coronado this is the key to the rest of the whole island" Kitt Walker tells 10News. Walker and her husband have lived in Coronado for years and say it's a staple piece for the community, "if it hadn’t been for the hotel del, Coronado wouldn’t even be here to speak of". In fact, Richard Walker gave walking tours of the resort for years. They both have ties close to the resort. They're looking forward to the repairs in order to preserve the resort for many more years to come. The first phase of the project includes the first of two underground parking structures. The entire project also includes adding 142 new guest rooms, a new Conference Center and repairs to the roof. The entire project is expected to be complete by the end of 2021. Bell tells 10News the construction could cause some headaches but they'll be worth it, "which will be noisy dusty dirty incovienent but at the end I think it will be a beautiful project". Many in the community say it's well overdue and a small price to pay to keep the Hotel del around for another 100 years, "if it hadn’t been for the Hotel del, Coronado wouldn’t even be here to speak of" Walker tells 10News.